DVD-to-ipod is the powerful, convenient and high-efficient software to convert DVD to ipod. It is easy to use, fast in speed, excellent in quality and reasonable in price. It is your first and best choice when you want to convert your dvd to ipod. Digiters DVD to iPod Converter is the easiest-to-use and fastest DVD to iPod converter software for apple iPod movie and iPod video. Aimersoft DVD to iPod Converter is a powerful yet easy-to-use DVD to iPod ripper that can convert DVD to iPod video MP4 (MPEG-4) H.264 and rip DVD to iPod MP3 and M4A audio formats with excellent quality and super fast conversion speed! Domeru DVD to iPod Converter + Video to iPod Converter Suite is a One-Click, All-In-One solution to convert DVD to iPod, Tivo to iPod, DivX movie to iPod, Xvid movie to iPod, MPEG video to iPod, WMV to iPod, AVI to iPod, RealMedia to iPod, etc. Amadis DVD to iPod/PSP/3GP/MP4/AVI video converter is an powerful and easy DVD iPod/PSP/3GP/MP4/AVI ripper application for converting DVDs to MP4 movie and video with excellent output quality. 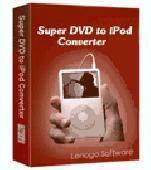 1st PQ DVD to iPod Video Converter is released. It's a one-click, all-in-one solution to convert DVD, Tivo, DivX, MPEG, WMV, AVI, RealMedia and many more to iPod Video. Cucusoft DVD to iPod Converter Build 2007 is the easiest-to-use and fastest DVD to iPod converter software for Apple iPod Movie and iPod Video.